Windows Insider Program – Be an Insider! One day at the BUILD 2015 I had a talk with Jeremiah, who is the Responsible for Windows Marketing worldwide and the Windows insider program, We have an awesome conversation and we talked about the Windows Insider Community in Germany. Some weeks later we meet us at the GDC (Games Development Conference) in Cologne and the gamescom. He organizice an awesome program of three days from GDC to gamescom. At first we had private sessions with the Microsoft Coroperation speaker on the GDC about Windows 10 an Crossdevice development and one about the using and options to use cortana into games. I would like to say, this was the first highlight and it was very cool to have the possiblity to ask questions. In this result my next game will have a cortana integration, but later more to my new project. After this private session and a little meal we went to the GDC and the other ones went into the sessions. I was divide up at the Microsoft GDC booth, in this result I worked their and had a lot of talks with gamedevelopers. I love to speak about project astoria and more times about UWP Apps on Windows platform and gamedevelopment with the Microsoft Holo Lens. I hope our next hackaton will be starts very fast. The second day started with a guided tour through the “Kölner Dom” and the city of Cologne. After 65 minutes the rain began and Martin (Community-Manager Microsoft Corp.) organize some rain capes for our group. Thank you very much for this and for the very cool and good Organisation! Moreover we have free space for us and I went to the Microsoft GDC booth to help the Microsoft guys. In this result I found two new teams for the imaginecup 2016. At the end of the day we have a nice dinner at an spanish restaurant and went to the XBOX Fanfest. 500 xbox fans and we get the chance to see and play the games before the gamescom starts the day after. 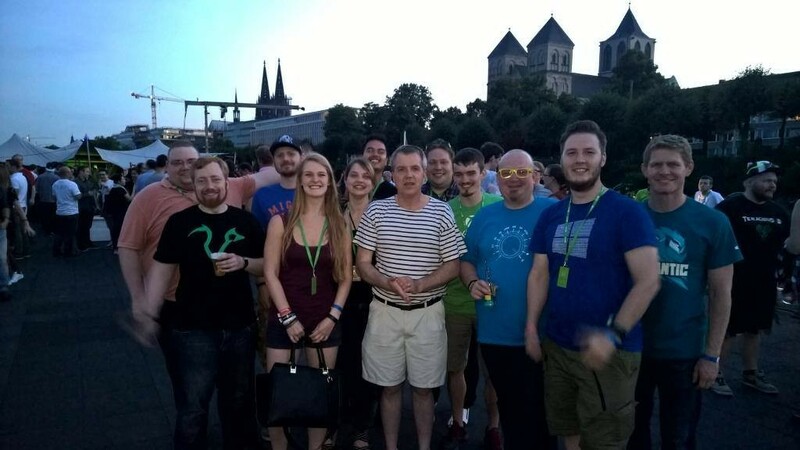 With a xboxfanfest batch you can go to the xbox boat party on the next day. On the xboxfanfest we get tshirts, a backpack, posters, something to eat and drink and the option to take pictures, play games, networking and speak with the Microsoft employees of the gaming teams. I talked more than 30minutes with the Minecraft guy who develop the Windows 10 Minecraft Game. At the end of this day we went to the internal Microsoft party in a nice and cool club in Cologne. We went, ohno we were dived by a VIP shuttle service. All in all together I will say a very huge awesome Thanks for their patience, the option to give feedback to Windows/Insiders/Gamedevelopment/Development (UWP), the atmosphere and for all of this! For the ideas, for the lead and the awesome days, the insider program: Desiree & Jeremiah! You rock the world! For the organization, pictures, social media and all of the stuff: Martin!! You rock! For the care of us insiders and all of the answers and all of this cool talks: Anthony! You rock! For the private sessions, a lot of awesome talks and your help: Petri and Juan form the Microsoft Corp. DX. My next cross device game will have Cortana 🙂 You rock! For all the support and help: Melissa! You rock! For the GDC: Corey, Jon and the hole Microsoft team: Thank you! You rock! Kristina (Gaming), Boris (Windows/Games), Malte (Azure/ MSP Program) – You rock !! Next Post Windows 10 – which program do you install?